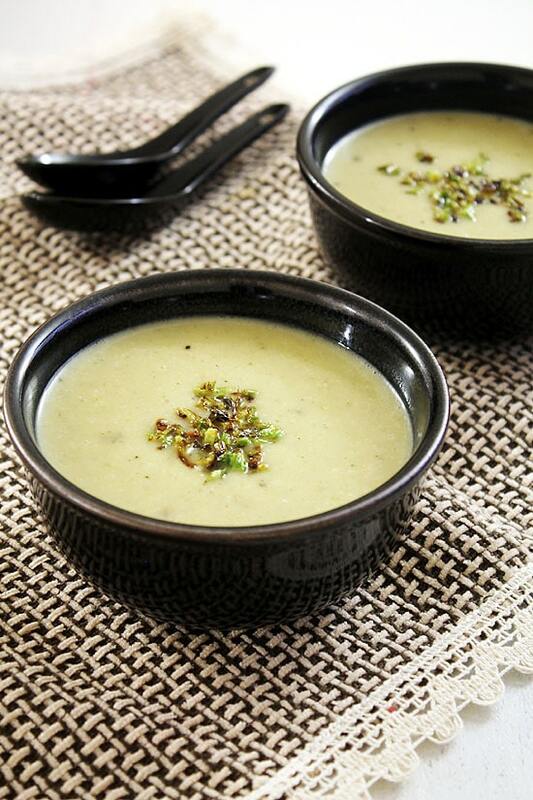 Celery soup recipe – creamy, flavorful and easy to make soup recipe. 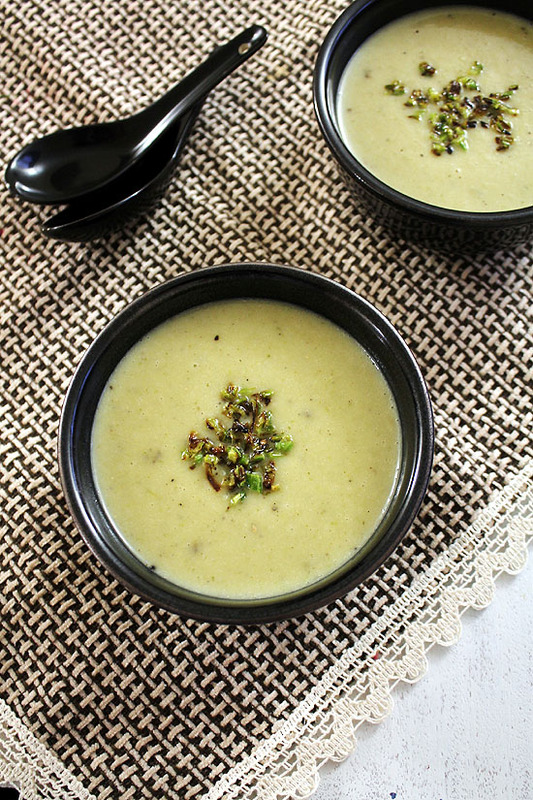 This is made from celery and potato, hence it is called celery and potato soup recipe. There is a routine in my family. Whenever I make indo-chinese meal, after few days we enjoy this creamy celery soup. I buy a bunch of celery to add into any chinese dish. In that we need very little amount of celery and I am left with almost whole bunch. And to use that I make this soup. The creamy texture is coming from potato. This is the healthier option than adding the heavy cream. Also I have added a touch of milk at the end which adds more creaminess. I have cooked finely chopped celery till they crisp up slightly and added that as a topping. This adds nice texture and bite to the creamy soup. You can skip this step, but I highly recommend. 1) Heat the 1 tablespoon of oil in a saucepan on medium heat. Once hot add onion and garlic. 2) Sprinkle little salt to speed up the process. 3) Cook till onions becomes light brown in color. 4) Now add all purpose flour. 5) Mix and cook for a minute or till the flour’s raw edge is gone. 6) Now add potato and celery. 7) Also add vegetable broth. 8) Add cilantro and celery leaves. Also add salt. 11) While it is cooling, let’s make the topping. Heat 1 teaspoon of oil in a pan on medium heat. Once hot add chopped celery. 12) And saute with stirring frequently till it gets slightly brown and crisp up. Remove it to a plate or bowl and keep it aside. 13) Now the soup mixture is cooled slightly, using immersion blender, make smooth puree. Or use blender. If it is too thick then you can little more water or stock at this moment. 14) Turn the heat back to medium. Add milk and mix. 15) Add black pepper powder and bring it to a boil. Taste and adjust the salt and pepper as needed. 16) Lastly add crisp celery. Remove this celery and potato soup into a bowl. Top with more crispy celery topping and serve. Serving suggestion: Serve this celery and potato soup as a light meal along with a piece of toast, baguette, garlic bread or chilli cheese toast. It can be served as starter in little portion and top with croutons. Chop onion, garlic, celery and potato. Also finely chop the celery for topping and keep it aside. Heat the 1 tablespoon of oil in a saucepan on medium heat. Once hot add onion and garlic. Sprinkle little salt and cook till onions becomes light brown in color. Now add all purpose flour. Mix and cook for a minute. Now add potato and celery. Also add vegetable broth. Add cilantro and celery leaves along with salt. Simmer for 15-20 minutes or till the potatoes and celery are cooked and soft. While it is cooling, let’s make the topping. Heat 1 teaspoon of oil in a pan on medium heat. Once hot add chopped celery. And saute with stirring frequently till it gets slightly brown and crisp up. Remove it to a plate or bowl and keep it aside. Now the soup mixture is cooled slightly, using immersion blender, make smooth puree. Or use blender. If it is too thick then you can little more water or stock at this moment. Turn the heat back to medium. Add milk and mix. Add black pepper powder and bring it to a boil. Lastly add crisp celery and serve.